Stephen L. Carter is a novelist and a law professor at Yale. That is quite impressive all by itself. But he comes from a family with multiple luminaries, perhaps none that shone brighter than his grandmother, Eunice Hunton Carter. In his biography of his grandmother, Invisible, Carter tells the story of a woman who should never be forgotten. Eunice Hunton was born to remarkable parents. Her father was revered for his work with the YMCA, loved so deeply that upon his passing young men across the country lit candles and met together to mourn his loss. Her mother traveled through Klan areas in the south to organize black women. It is little wonder that Eunice grew up with a strong sense of purpose and confidence. She grew up in a time, though, when opportunities for African Americans were scarce and for women were even scarcer. Still, she earned her law degree and began working for Thomas Dewey in the NYC District Attorney’s office during the 1930s. Dewey had 20 assistants working with him to take down infamous mob leader “Lucky Luciano.” Nineteen of them were white males. The other was Eunice Hunton Carter. Luciano was the chief mob boss in NYC after the murder of Dutch Schultz, a murder that quite probably was ordered by Luciano himself. Almost any organized crime in the city tied back to him one way or another. Eunice Carter realized that this included prostitution. Years before, prostitution was not organized. Then, some people began “booking” the prostitutes. This helped keep the “girls” out of jail by moving them around from place to place, and because these “bookers” were responsible for more women they could spend more to buy lawyers and pay bribes to police and judges. Eunice had become aware of this growing trend during her work with the Women’s Court prior to joining the DA’s office, and she requested permission from Dewey to look further into it to determine whether the Combination (as the prostitution conspiracy ring was known) reached all the way to Luciano. Dewey was skeptical and reluctant at first, but Carter was persistent. He finally agreed, and Carter began to make the case. At first she was alone in her work. She soon found enough evidence that a second attorney joined her. Eventually, almost the entire team was working the Combination angle, and eventually Luciano was brought up on prostitution related charges. He was found guilty. The most powerful mobster in America was brought to trial and convicted because of the persistence and acute legal mind of one person. An African-American woman. In the 1930s. Carter continued working in the DA’s office for many more years, and also became active in Republican politics. She campaigned vigorously for her mentor, Dewey, in his rise within New York and the US political scene. She held multiple leadership positions in both US and international groups advocating for expanded rights for women and for people of color. She was friends with leaders in politics, entertainment, sports, and advocacy, especially those in the “darker” America (Stephen Carter’s term). She was also a leader of Harlem’s “sassiety,” wealthy (and according to the author, snobbish) African American women who were among the elite of New York’s black cultural and business life. Carter’s biography is powerful, affectionate, but also open-eyed. He does not shy away from his grandmother’s faults. She apparently was an indifferent mother, she could be insensitive to others, her marriage suffered, she held grudges, and she was extremely driven. These very human failings, though, do not obscure the fact that she did extraordinary things during a time when blacks, and especially black women, were dismissed, demeaned, ignored, and forgotten. Carter is also clear about why she was forgotten by history. There are obvious answers: she was a black woman whose heyday came in the 1930s and 1940s. Black women today still struggle to get appropriate recognition for their accomplishments, especially when those accomplishments come in areas considered the purview of white men, such as law. But there were less obvious reasons as well, which Carter gives appropriate consideration to. Eunice Hunton Carter’s brother, Alphaeus, was a known communist. It is highly possible that his communist sympathies derailed his sister’s ambitions for political advancement or a judgeship. (He was arrested and served some time in jail, and eventually fled the US and lived the rest of his life in Africa.) Eunice’s personality also led to her falling out with some other leaders, whether because of competing ambitions or simply arrogance, and those interpersonal conflicts kept her from achieving some leadership positions she had sought. None of that changes what she did accomplish. She set herself against the most powerful mobster in America. And she won. 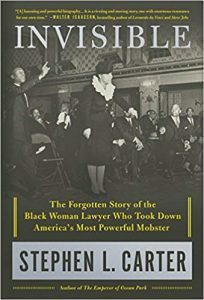 Eunice Hunton Carter deserves to be remembered, and hopefully this biography by her grandson, novelist and law professor Stephen L. Carter, means that she will no longer be Invisible.